The American Legion's Patriot Day ended on that resounding note Thursday (Sept. 11) with voices ringing out in song "God Bless The USA." Voices of all ages particularly rang out on the chorus of Lee Greenwood's song. Cannon County's Courthouse courtroom was filed with people remembering that particular day when New York City and Washington DC was attacked by foreign terrorists. Some 3,000 Americans lost their lives in the initial attack. Guest speaker Tony Burnett, law enforcement liaison for the governor, shared a quote from President Abraham Lincoln. "My concern is not whether God is on our side; my greatest concern is to be on God's side, for God is always right." Burnett recalled where he was when he first heard news of the 9/11 attack. "I was in the Courthouse. We were having court that day," he said, recounting his thoughts. "I was hoping it was just an accident. That was my first thought." All too soon, the truth was obvious. "An attorney walked in. He had a tear in his eye," Burnett said. "I asked him what was wrong and if I could help. He had a close friend in the twin towers that day." "America rose to the occasion," he said. The nation quickly established priorities and we're soon flying our flags even higher. But that came at a cost to most everyone. "I couldn't hear the National Anthem without crying," Burnett said. "Patriotism shouldn't diminish with time," he said. Quoting British Prime Minister Winston Churchill, Burnett said, "Never in the field of human conflict was so much owed by so many to so few. " "We all felt we owned a debt of gratitude," he continued. That debt grew when Cannon County received word of the death of Lt. Frank Walkup IV who was killed by an explosion in Iraq in 2007. He was the son of school board candidate Frank Walkup. People lined the streets of Woodbury to honor the slain soldier. 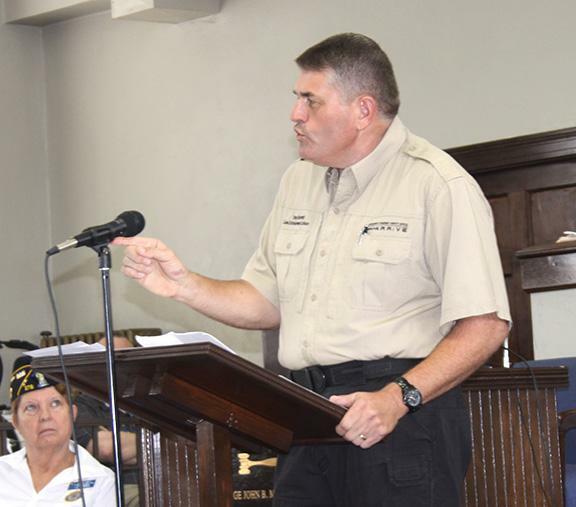 "Never in my life have I been so proud to be a citizen of Cannon County," Burnett said. "God bless, Cannon County," he said. Christine Barrett, past commander of Post 279, was emcee for the event which began with a rendition of the "Star Spangled Banner" by the Cannon County High School Band, led by John Duggin. Michael Underhill, Cannon County Fire Chief, struck the "Four Fives" on the fire department's bell. That's a tradition when a firefighter dies in the line of duty, a bell is struck to alert comrades to his passing. It is done in a series of four, five strikes each. Special recognition was also given to Post 279 members, the Woodbury and Cannon fire departments, the police and sheriff's department as well as EMT personnel and Cannon County's veterans.